Lancaster Manufacturing has two divisions and they are internally connected. The connection is smooth and delicious frozen custard. At We All Scream Consulting, we’re the one-stop shop for people wanting to open an ice cream store. We can supply you with all the equipment you’ll need to get your shop up and running. More than that, we can also provide you with guidance. We’ll walk with you step-by-step through the process of opening your own ice cream shop to help you create a successful business. Our owner, Tony Carey, is a highly-regarded expert in the frozen custard field. He’s served the ice cream industry in a variety of roles since 2001. His vast experience includes being VP at the top frozen dessert machine company in the U.S., educating and advising new ice cream store owners, plus designing and manufacturing his own line of frozen custard machines. Tony enjoys offering his expertise and high-quality equipment to help fledgling ice cream business owners thrive. 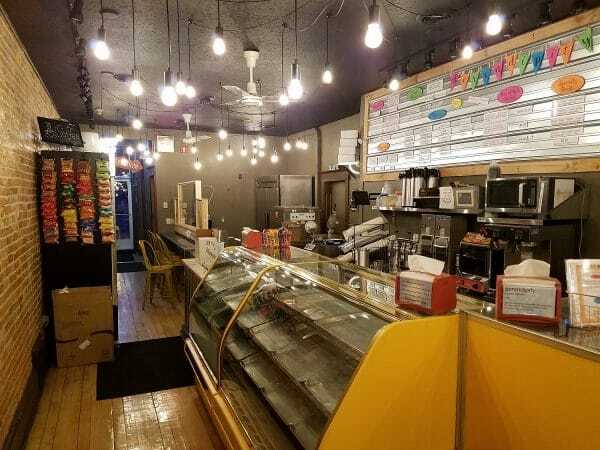 If you’d like to talk to Tony about your plans to open an ice cream store, feel free to contact him by phone at 877-356-6176 or via email at tcarey@lancastermanufacturing.com. You can also use the convenient contact form provided on this site. Every year, we work closely with a select group of ice cream entrepreneurs to help them establish profitable businesses. We do this by providing insightful information, advice and guidance on the frozen custard industry along with all the high-quality equipment you’ll need to successfully launch your business. If you’d like more information on how we can help you accomplish your ice cream dreams, just keep reading; we’ve provided an in-depth look at the services we provide below. Let’s be honest – there are a lot of restaurant equipment dealers to choose from. But with We All Scream Consulting, you get more than just machinery; you get valuable insights on how to successfully open an ice cream store. You have a dream to open an ice cream store, but do you have the money? Finding money to fund your dream is often the biggest barrier facing ice cream entrepreneurs. Where do you even start to look for financing? Tony can help guide you and offer suggestions so you can secure the money you need to finance your dream. You know what they say – it’s all about location, location, location! If you choose the wrong location, you’re dooming yourself to failure. Should you buy a smaller store in the middle of downtown with limited parking or the larger, less expensive shop with its own parking lot? Tony can help you avoid making disastrous missteps that could cost you lost time, money and effort. Do you know who you’ll be marketing to? The most successful businesses are those that have a clear picture of the type of client they’d like to reach. Do you want to draw in families with children or are you more interested in attracting a young, hip crowd? Tony can help you figure out the best target market for your store and teach you how to reach them. The layout of your ice cream shop can have a considerable effect on how well your business operates. If foot traffic doesn’t flow well and long lines cause crowding around tables, it will create an unpleasant atmosphere for visitors. In addition to traffic flow, you also need to determine where machines should be placed, how to display the product, the best location for restrooms, etc. Getting into business requires doing a bit of preliminary paperwork. The amount and type of paperwork needed often changes from state to state. Knowing what permits you need and how to obtain them can be confusing. Let Tony help you navigate through the requirements and teach you how to get the permits you need. This guide will provide pointers for opening an ice cream store. Lancaster Manufacturing not only makes frozen custard machines, we have a comprehensive consulting service to help entrepreneurs open their own ice cream store. All of the pointers are services that are provided by Lancaster’s We All Scream consulting. We’ll assist you from start to finish. This free guide includes choosing a location, functional and cost-effective store layout, assistance with health and building permits, helping you choose certified and reputable contractors and more. If you’d like to learn more about what it takes to build a successful ice cream store, be sure to request our free e-book. It offers all sorts of insights into the frozen custard industry that will help you along the path towards a prosperous business. Starting your own business from the ground up can be challenging. With all the planning, preparation, and decision-making that needs to happen, aren’t you better off working with someone who knows the ice cream industry inside and out? Tony has helped numerous clients open thriving ice cream stores all over the country. You’ll receive insights into creating a successful frozen custard business. Tony will walk alongside you step-by-step through the process of opening your own ice cream store. He can help you avoid mistakes that could cost you your business down the road. You’ll learn how to operate and care for your frozen custard equipment. You’ll benefit from Tony’s extensive experience in design, manufacturing, and business management. Tony not only offers personalized advice and professional guidance, he can provide you with all the equipment you’ll need to open an ice cream store. He can advise you on everything from store concept and menu development to permit acquisition and hiring contractors. The relationship doesn’t end at opening – Tony will continue to offer support even after the doors are open. Our Machines and Equipment are of the Highest Quality! If you’re going to open an ice cream store, you’ll need to buy frozen custard machines. We offer both new and pre-owned frozen custard machines from our own line of equipment. Our machines were designed by Tony Carey, the owner of our company. Relying on his extensive knowledge of frozen custard, Tony created a machine that would consistently produce a superior quality of ice cream. Tony knew that many frozen dessert machines fail to produce quality ice cream because of two issues: large, inconsistent ice crystals and too much added air. That’s because when ice crystals in a frozen dessert are too large and of varying sizes, the product turns out to be grainy and a little bit crunchy. If the machine adds a lot of air during production, it causes the ice cream to lose flavor and density. Our machines eliminate both of these problems. With most machines, excessive amounts of air are added during the freezing process – six ounces of product actually consists of three ounces of air for every three ounces of mix! When you buy frozen custard machines from us, your end product will contain 5 ounces of mix and just 1 ounce of air. That means your frozen custard will be dense, rich and delicious! The issue of ice crystals occurs when frozen dessert takes too long to freeze. Many of the ice cream machines that you commonly find on the market continue to churn away at the mix, leaving you with large ice crystals and a sub-par product. Tony remedied this problem by designing a machine that would freeze the mix fast. With a shorter freezing time, the result is a flavorful dessert that’s dense, smooth and creamy. 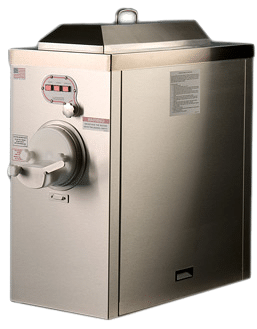 Floor Model or Counter Top: Before you buy frozen custard machines, you need to determine whether floor models or counter top machines will best serve your needs. There are several factors to take into account when making this decision. First of all, you need to assess how much space you have to accommodate the machine. Is there a large enough area to put a floor model or do you only have a small counter in the corner available? But space isn’t the only determining factor. You also need to decide how many flavors you’d like to offer and how much ice cream you plan on serving per hour before you buy frozen custard machines. For example, counter top models are the perfect choice if you just want to offer one or two flavors and don’t need a large output. But in order to provide patrons with a wide variety of flavor options, you’d need to upgrade to the floor model. Single, Double or Triple Barrel: The number of flavors you want to offer will also determine the number of barrels you need to have on your equipment. If you plan on offering a broad assortment of flavors every day, then the best option would be to buy frozen custard machines with multiple barrels. For those who are simply adding a single flavor of ice cream to their menus, a single barrel is all that’s necessary. New or Pre-Owned: We offer our frozen custard machines in both new and pre-owned condition. Pre-owned equipment is often a popular choice for business owners who want to buy frozen custard machines at a discounted rate. Every piece of pre-owned equipment we sell is thoroughly cleaned, refurbished and tested before it’s offered to our clients. We want to make sure that every item purchased from us will produce the high-quality desserts that customers expect. Those are just a few of the options available when you buy frozen custard machines from us. If you’re not sure which options will best meet your needs, all you need to do is talk to Tony. He’ll be happy to help you find the right equipment for your business. We’re obviously big fans of our own line of frozen custard machines. With our specialized design, we think the end product is pretty amazing! But we know that business owners like to have options, which is why we offer the entrepreneurs we work with a variety of brands to choose from. We’re not a brand-loyal dealer, unlike some equipment sellers you could do business with. When you buy frozen custard machines from us, you can choose equipment from a range of companies including Ross, Electrofreeze, Leon’s and Carvel. We’ll provide you with whatever equipment best meets your needs, regardless of the manufacturer. Buying frozen custard machines is a necessary step toward opening an ice cream store, but it’s really just a starting point. Depending on the size and scope of your business, you may also need other equipment such as dipping cabinets, a waffle cone maker, freezers, a coffee machine, refrigerated topping holders, a milkshake machine, ice cream cone dispensers and more. The good news is that you can come to us for all the equipment you need to open an ice cream store – we’ve got it all! And if you’d like some assistance in making a list of the necessary items for your business, just give Tony a call; he’d be more than happy to talk to you about your equipment needs. Share This Information With Your Network - Choose Your Platform!